Maple Bay Yacht Club (MBYC) is pleased to host the 2019 Vendee Saltspring along with our partners Saltspring Island Sailing Club (SISC) on July 5-7, 2019. Come join us for a convivial weekend of either single or double handed racing which will circumnavigate Saltspring Island. Boats will gather on Friday evening, July 6 at MBYC for registration and a dinner will be provided. Following breakfast served by MBYC, the race will begin on Saturday morning off the Maple Bay Yacht Club and finish on Saturday afternoon off the Saltspring Island Sailing Club in Ganges Harbour. A dinner will be served Saturday evening by the SISC along with a breakfast on Sunday morning. 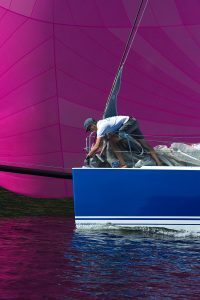 The second day of racing will start off SISC on Sunday morning and finish off MBYC on Sunday afternoon followed by a barbecue hamburger dinner at MBYC on Sunday evening. Moorage is provided for Friday and Sunday nights at MBYC and Saturday night at SISC. Please see the Notice of Race for further details. The entry fee is $225 for Double Handed and $130 for single handed.